ANUCHIN ARTEM was born in 1983 in Russian Federation. He is a professional pianist and composer. He has received degrees in music in Russia and USA. He has got MMA in Piano, and MMA in Composition, and PhD in Composition from St Petersburg State Conservatory; and MMA in Piano from Bowling Green State University. During his musical professional life Anuchin has become a winner of 30 international and national music competitions, that is, piano and composition contests. They include The Golden Key Piano Composition Competition, 2009, Vienna, Austria; The International Antonin Dvorak Composition Competition, 2010 and 2011, Prague, Czech Republic; The MMTA Piano Collegiate State Competition, 2010, Kirksville, Missouri, USA; The International Music Prize for Excellence in Piano Performance, 2010, Thessaloniki, Greece; The Contemporary Piano Residency Festival in conjunction with the Southeastern Composers League (SCL) Forum 2013, Morehead, Kentucky, U.S.A.; The Festival of Contemporary Music, 2013, San Francisco, California, U.S.A.; R. Strauss International Festival “BURLESKE”, 2014, Dusseldorf - Recklinghausen, Germany, and others. Twenty of his compositions have been published in music books in Russia and in International Online Journal of Contemporary Composition. 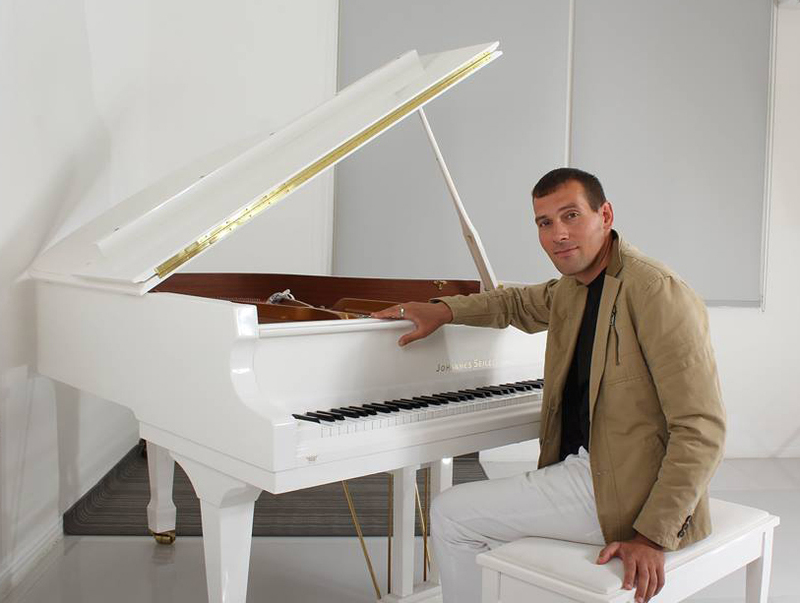 Anuchin takes part in numerous concerts as a solo pianist, as a performer of chamber ensemble, as a leader of an orchestra, and as a composer and a performing musician of his own piano compositions. As a music master he gives lessons in piano playing and composing for students of a college of music and a conservatory. 2016 - Present Professor of Piano and of Composition; Classic Music Arts Institute & Play Tunes, Muscat, Oman. 2013 - 2016 Associate Professor of Piano, M. I. Glinka Magnitogorsk State Conservatory, Magnitogorsk, Russia. 2011 - 2013 Piano Teacher and Composition Teacher in Home, Kansas City, Missouri, USA. 2010 - 2011 Graduate Teaching Assistant: Opera Accompanist, UMKC, Kansas City, Missouri, USA. 2008 - 2010 Graduate Teaching Assistant: Piano Accompanist, BGSU, Bowling Green, Ohio, USA. 2017 1st PRIZE & Honorable Mention in the 3nd Opus Dissonus Composition Competition, Brazil. 2017 2nd PRIZE [nomination: Professional International] in the 2017 Golden Key Piano Composition Competition, New York, USA. 2017 WINNER of the ABLAZE Records call for Master tapes for the “Millennial Masters Volume 8”, CD, Cincinnati, Ohio, USA. 2016 1st PRIZE [nomination: Professional International] at the 2016 Golden Key Piano Composition Competition, New York, USA. 2014 AWARD WINNER and SPECIAL PRIZE at the International Competition "Music and Earth" for Instrumentalists and Composers, Sofia, Bulgaria. 2014 WINNER of the ABLAZE Records call for Master tapes for the “Millennial Masters Volume 5”, CD, Cincinnati, Ohio, USA. 2014 2nd PRIZE at the International Festival-Contest "Spring of Bach" with Timerbaeva Elsa, soprano, Magnitogorsk, Russia. 2013 2nd PRIZE at the International Contest "The Magnet of Talents", with the Ensemble "Lira", academic vocals, Magnitogorsk, Russia. 2013 2nd PRIZE [nomination: accompaniment skills] at the International Contest "The Magnet of Talents", Magnitogorsk, Russia. 2013 WINNER of the 11th Annual Festival of Contemporary Music, San Francisco, California, U.S.A.
2013 WINNER of Contemporary Piano Residency Festival in conjunction with the Southeastern Composers League (SCL) Forum 2013, Morehead, Kentucky, U.S.A.
2012 WINNER of ABLAZE Records call for Master tapes for the Millennial Masters CD, Cincinnati, Ohio, U.S.A.
2011 2nd PRIZE and Special PRIZE at the 2nd International Antonin Dvorak Composition Competition, Prague, Czech Republic. 2011 AWARD WINNER at the Open All-Russia Contest of Composers “Choral Laboratory XXI Century”, St. Petersburg, Russia. 2011 SEMI-FINALIST at the Radio “Orpheus” Composition Competition, Moscow, Russia. 2010 1st PRIZE at the International Music Prize for Excellence in Composition, Thessaloniki, Greece. 2010 1st PRIZE, Gold medal at the International Music Prize for Excellence in Piano Performance, Thessaloniki, Greece. 2010 1st PRIZE at the MMTA Piano Collegiate State Competition, Kirksville, Missouri, U.S.A.
2010 SEMI-FINALIST at the 3rd World International Piano Competition, Santa Fe, New Mexico, U.S.A.
2010 FINALIST in the American Liszt Society Bicentennial Composition Competition, Athens, Georgia, U.S.A.
2010 3rd PRIZE and Special PRIZE in the 1st International Antonin Dvorak Composition Competition, Prague, Czech Republic. 2010 3rd PLACE in the Dr. Marjorie Conrad Peatee Art Song Competition with Rebecca Eaddy, soprano, Bowling Green, Ohio, U.S.A.
2009 2nd PRIZE in the Golden Key Piano Composition Competition, Vienna, Austria. 2009 2nd PRIZE in the 49th Annual Young Artists Competition for piano and winds/brass, Lima, Ohio, U.S.A.
2007 1st PRIZE in the 41st Annual Competition in Music Performance, Bowling Green State University, Ohio, U.S.A.
2003 PRIZE-WINNER in the Festival-Competition “Platform Nine and 3/4” - composing music based on books of J.K. Roling about Harry Potter, Yekaterinburg, Russia. 2003 PRIZE-WINNER in the 3rd International Junior Competition of Composers - opera on Biblical events, St. Petersburg, Russia. 2002 AWARD WINNER in the 1st South-Ural Open Competition of Young Composers named after S. Prokofiev, Chelyabinsk, Russia. 2000 AWARD WINNER in the International Children’s Competition “I am a Composer”, St. Petersburg, Russia. 2000 1st PRIZE in the 1st International Junior Competition of Pianists-Composers dedicated to Creative Works of S. Slonimsky, St. Petersburg, Russia. 1999 1st PRIZE in the 2nd Open Siberian Competition of Young Composers, Novosibirsk, Russia. 1998 WINNER of RF Ministry of Culture Scholarship Award. 1998 2nd PRIZE in the Competition for Composing the Hymn of Snezhinsk, Snezhinsk, Russia. 1998 3rd PRIZE in the International Children’s Competition “I am a Composer”, St. Petersburg, Russia. 1997 Special PRIZE “Hope of Russia” in the All-Russian Competition of Young Pianists named after V.I. Safononv, Pyatigorsk, Russia. 1996 Special PRIZE of Belarus Composers Union in the International Competition of Young Composers “Hope”. Grodno, Belarus. 1996 WINNER of RF Ministry of Culture Scholarship. 1994 3rd PRIZE in the Zone Competition for Young Pianists, Ozyorsk, Russia. 2016 2nd PRIZE, II The International Festival-Contest "Spring of Bach", Magnitogorsk, Russia.Nadezhda Pestryakova, soprano and Artem Anunchin, piano. 2016 1st PRIZE, II The International Festival-Contest "Spring of Bach", Magnitogorsk, Russia.Olga Mikheenkova, soprano and Artem Anunchin, piano. 2016 AWARD WINNER, IV Regional Contest of Children and Youth Creativity "Breath of Spring", Magnitogorsk, Russia.Yulia Glushkova, vocal and Artem Anunchin, piano. 2015 3rd PRIZE, III International Art Competition "Golden Panorama", Magnitogorsk, Russia.Ma Vejtsan, piano solo and Artem Anunchin, piano instructor. 2015 2nd PRIZE, III International Art Competition "Golden Panorama", Magnitogorsk, Russia.Galina Abramova, academic vocals and Artem Anunchin, piano. 2015 3rd PRIZE, III International Art Competition "Golden Panorama", Magnitogorsk, Russia.Jana Azatyan, academic vocals and Artem Anunchin, piano. 2015 3rd PRIZE, II International Singing Competition "Gori, Zvezda! ", Magnitogorsk, Russia.Nadezhda Pestryakova, vocal and Artem Anunchin, piano. 2015 AWARD WINNER, II International Singing Competition "Gori, Zvezda! ", Magnitogorsk, Russia.Jana Azatyan, vocal and Artem Anunchin, piano. 2015 AWARD WINNER, The V International Festival-Competition of Soloists, Ensembles and Orchestras of Folk Instruments "Europe-Asia", Magnitogorsk, Russia.Ma Vejtsan, piano solo and Artem Anunchin, piano instructor. 2015 AWARD WINNER, The All-Russian Festival-Competition, devoted to the 175th anniversary from the birthday of P. I. Tchaikovsky, Magnitogorsk, Russia.Ma Vejtsan, piano solo and Artem Anunchin, piano instructor. 2015 AWARD WINNER, The All-Russian Festival-Competition, devoted to the 175th anniversary from the birthday of P. I. Tchaikovsky, Magnitogorsk, Russia.Vitaly Loy, vocal and Artem Anunchin, piano. 2015 AWARD WINNER, The All-Russian Festival-Competition, devoted to the 175th anniversary from the birthday of P. I. Tchaikovsky, Magnitogorsk, Russia.Nadezhda Pestryakova, vocal and Artem Anunchin, piano. 2014 AWARD WINNER, The International Festival-Contest "Spring of Bach", Magnitogorsk, Russia.Galina Abramova, vocal and Artem Anunchin, piano. 2014 2nd PRIZE, The International Festival-Contest "Spring of Bach", Magnitogorsk, Russia.Ekaterina Smirnova, soprano and Artem Anunchin, piano. 2014 2nd PRIZE, The International Festival-Contest "Spring of Bach", Magnitogorsk, Russia.Elsa Timerbaeva, soprano and Artem Anunchin, piano. 2013 2nd PRIZE, The International Contest "The Magnet of Talents", Magnitogorsk, Russia.The Ensemble "Lira": Alexandra Chernova & Nadezhda Pestryakova, academic vocals and Artem Anunchin, piano. 2010 3rd PRIZE, The Dr. Marjorie Conrad Peatee Art Song Competition, Bowling Green, Ohio, USA. Rebecca Eaddy, soprano and Artem Anunchin, piano. 2009 1st PRIZE, The Bowling Green Competition in Music Performance, Bowling Green, Ohio, USA. 2009 1st PRIZE, The Bowling Green Competition in Music Performance, Bowling Green, Ohio, USA. James Fusik, alto saxophone and Artem Anuchin, collaborative pianist. 2011 Honorary Membership of the Russian Federation Composers Union. 2010 Honorary Fellow of the National Academy of Music. Grand Junction, Colorado State, USA. 2010 Honorary Membership of the Golden Key International Honor Society (US & Canada), Atlanta , GA, USA. 2017 The Golden Key Music Festival, Vienna, Austria. 2014 R. Strauss International Festival “BURLESKE”; Dusseldorf - Recklinghausen, Germany.German pianist Rainer Maria Klaas made the premiere performance of Anuchin’s composition “The Sounds of the Full Moon” during this Festival. 2013 The 11th Annual Festival of Contemporary Music. San Francisco, California, U.S.A.
2013 The Contemporary Piano Residency Festival in conjunction with the Southeastern Composers League (SCL) Forum 2013, Morehead, Kentucky, U.S.A.
2009 The Golden Key Music Festival, Vienna, Austria. 2005 The 3rd International Musical Festival “Youth Academies of Russia”, St. Petersburg, Russia. 2004 The 16th International Festival “Sound Races”, St. Petersburg, Russia. 2003 The 39th International Festival “Petersburg Musical Spring”, St. Petersburg, Russia. 2003 The 14th Musical Festival “I Have Returned to My City”, St. Petersburg, Russia. 2001, 1999, 1997, 1995 The Festival “Young Composers from Urals”, Yekaterinburg, Russia. "Featuring winners of the 41st Annual Competitions in Music Performance"
Concerto for Piano and Orchestra (2006). Seven Choruses upon Poems by A. Tarkovsky, Yu. Morits, Yu. Drunina, N. Rubtsov for Mixed Chorus a cappella (2006). Wood Wind Quintet for Flute Piccolo, Fl and Three Clarinets in B (2006). Three Romances upon Poems of Silver Age Poets for Bass and Piano (2003). Opera-Cantata Based on the Old Testament "The Ark Has Stopped" (2002). Three Preludes and Fugues for Piano (2011). The Sounds of the Full Moon (2012). Music of the Birds of Passage for Five Clarinets (in B) (2014). Bagatelle for Solo Harp №6 (2015). BWV 988 - "Goldberg Variations"
Polonaise, Op.53, Polonaise in A-flat major "Heroic"
No. 2 in A minor, "Molto Vivace"
No. 10 in F minor, "Allegro Agitato", or "Appassionata"
"Toccata" extradite de la suite "Le Tombeau de Couperin"
"6 Romances", Op. 6, No.6 "No, only He Who Has Known..."
"Fifteen Songs", Op.26, "The Ring"
"Ten Pieces from Romeo and Juliet", Op. 75, No.10, "Romeo and Juliet before Parting"